Lead halide perovskites have recently been used as light absorbers in hybrid organic–inorganic solid-state solar cells, with efficiencies as high as 15% and open-circuit voltages of 1 V. However, a detailed explanation of the mechanisms of operation within this photovoltaic system is still lacking. Here, we investigate the photoinduced charge transfer processes at the surface of the perovskite using time-resolved techniques. Transient laser spectroscopy and microwave photoconductivity measurements were applied to TiO2 and Al2O3 mesoporous films impregnated with CH3NH3PbI3 perovskite and the organic hole-transporting material spiro-OMeTAD. We show that primary charge separation occurs at both junctions, with TiO2 and the hole-transporting material, simultaneously, with ultrafast electron and hole injection taking place from the photoexcited perovskite over similar timescales. 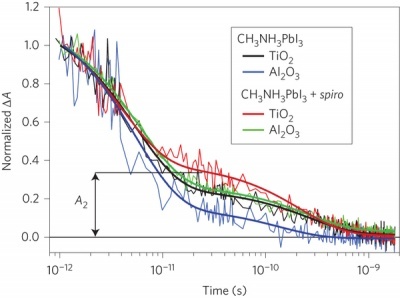 Charge recombination is shown to be significantly slower on TiO2 than on Al2O3 films. Marchioro, A., Teuscher, J., Friedrich, D., Kunst, M., van de Krol, R., Moehl, T., Grätzel, M.l., and Moser, J.-E. (2014) Unravelling the mechanism of photoinduced charge transfer processes in lead iodide perovskite solar cells. Nat. Photon. 8, 250-255, (10.1038/nphoton.2013.374). Figure 1: Schematic diagram of energy levels and electron transfer processes in an HTM|perovskite|TiO2 cell. Figure 2: Time evolution of electron and hole populations in photoexcited CH3NH3PbI3 perovskite in various systems.